Once upon a time there lived a Jewish lady, of modest stature and of a certain age, who walked with a limp and liked to sing to the birds. Through the bars on her window she would treat the titmice to a Mozart aria, and then await their call, the transcription of which she wished, as she wrote to a friend, to be the only adornment on her grave. This lady spent much of her time between 1915 and 1918 writing magnificent letters to her many female friends, to distract them from the carnage of a war that she herself had opposed from the beginning. She also translated a long novel from Russian into German, from her fourth-best language into her second-best, or, as it happened, from the language of her first lover into that of her last. She had been unhappy in love, but had always wanted to make a man happy, to “pull down a few stars to bestow on someone for use as cufflinks,” and to bear a child. When her young friend was killed on the Western Front, she grieved quietly and kept her head up. Though she sometimes mentioned in her letters the fate of comrades whose suffering was worse than hers, on battlefields or Siberian plains, she never complained of her own time in German prison. She had a sustaining faith in the common people, above all in the downtrodden Poles to whom she felt closest, but generally in the workers of Europe, who could be trusted to turn an unwanted war into a social revolution. When the war finally ended, she exploded onto the scene of a defeated and divided Germany, calling less radical socialists the pygmies and pimps of counterrevolution, only to be murdered by the real counter-revolutionaries of the German far right. Her grave bears not the call of the titmouse but her name, Rosa Luxemburg, and the date of her death, January 15, 1919. Soon thereafter her friends and admirers began to collect and publish her private letters, a custom that continued throughout the century, first in German, then in Polish, and now in English. Her letters to her male lovers and female friends, which constitute the bulk of this edition as of some earlier ones, are meant to show that Rosa Luxemburg was not only a doctrinaire Marxist and a ruthless revolutionary but also a human being. During her lifetime she was known as the pitiless foe of dithering comrades, the Jewish-Polish bogey of the German bourgeoisie, the Red Rosa who wanted Europe aflame. She was, of course, all of those things, just as she was, of course, a woman with feelings. The attempt to rescue her public reputation through the ritual unveiling of her private life, which has now continued for nearly ninety years, is based upon a surprisingly sentimental, not to say bourgeois, premise. Surely only a decadent liberal would accept the traditional distinction between public life and private life, and believe that what happens in private is somehow more authentic than what happens in public. It doesn’t take a very developed dialectical mind to notice that Luxemburg’s private and public lives were very much dependent upon each other, that they formed a coherent whole, a single person. In the Polish historical collections edited in the communist period by Feliks Tych, as in the sympathetic biography written by J.P. Nettl, this question was addressed by tactful references to the secretive socialist Leo Jogiches, who for much of Luxemburg’s life was her lover and political adviser. “What do you think about all this?” she would ask him. “Write immediately!” The bulk of the letters in the first half of this collection were written to him in Polish, and have been doubly translated, first to German, then to English. Jogiches wrote to her in Russian, and his missives, like those of other correspondents, are absent. The underlying association between politics and love cannot be deduced from Luxemburg’s letters alone, even with the help of the accompanying apparatus. The introduction contrives not to mention her Jewish origins, and it vastly understates her Polish connections. The footnotes in this book are often uninformed, or polemical, or both at once. None of her opponents is taken at all seriously; they are “nationalists” or “opportunists” or the like. Though it is almost (but not quite!) bracing to be confronted again by the terms of abuse of the old Left, they do not really cast much light on Luxemburg’s life. Some fairly major historical figures are mentioned only as people who wrote articles about or against Luxemburg. Why should we want to know that Leon Wasilewski was a leading student of the national question, and later foreign minister of Poland, known for his toleration and decency, when we can know that he wrote a “slanderous” article about Luxemburg? When Luxemburg mentions some bit of gossip about an opponent, the reader is often left with that. Why should anyone know that Ignacy Daszyński was one of the more impressive of the socialist leaders of his and Luxemburg’s generation, when we can know that someone once said that his wife was pregnant when he married her? If this book were taken literally, the figure who emerges would be someone with a sadly tumultuous love life who happened to be right on every major question of her day and was unfortunately opposed by a series of misguided nonentities, whose lives and purposes can be understood through clichés and gossip. Precisely because of her significance, Luxemburg deserves a more thorough sort of inquiry than this. Luxemburg was perhaps the leading activist and thinker of the left wing of the Second International, the association of socialist parties that met in international congresses between 1889 and 1914 and regarded itself as a shadow government of Europe. Despite the general acceptance of Marxism, and thus the widespread belief that changes in the modes of production were bringing political revolution, it was always a bit unclear how socialists meant to resolve the question of power. On the one hand, the Second International was rhetorically committed to an international proletarian revolution brought by history. On the other, it united active political parties, and so implicitly endorsed the various national political systems in which they functioned and sometimes thrived. Indeed, the more comfortable socialist parties were with the status quo at home, the more influential they were in the International. French socialists, operating within a democratic republic, could afford to be concerned with questions such as the legitimacy of a socialist taking up a ministerial post. In Germany, the socialist party performed extremely well in parliamentary elections, though in an empire where parliament counted for very little. Thus German socialists, vaguely confident about the future, tended for the time being to build a kind of alternative civil society around labor unions and other organizations. Karl Kautsky, the leading German Marxist thinker of the day and the editor of the immensely influential Die Neue Zeit, was the master of revolutionary quietism. He maintained that a scientific Marxist understanding of society proved that the revolution was inevitable, but that Marxists could not know in advance just what form the revolution would take. Thus we might as well keep on as we have been, and not ask ourselves any very difficult questions. It was the East Europeans, people such as Luxemburg, who tended to cause problems for the Second International. Their parties were illegal rather than embedded in political systems, and they themselves were often forced to work in emigration, tugging at the hearts and purse strings of French and German comrades. Since the Russian Empire was autocratic and possibilities for political action were close to nil, Russian, Polish, and Jewish socialists tended to take revolution seriously. Hounded by the Okhrana, the Russian imperial secret police, they tended to become masters of conspiracy themselves. The Russian Empire was multinational, with large numbers of Poles, Jews, and Ukrainians in its western borderlands, and so socialists there all confronted, whether they wished to or not, the national question. Would the socialist revolution embrace the entire Russian Empire at once? Would it begin in its more industrialized regions, such as the great textile city Łódź, where there was certainly class tension but where the population was Polish, Jewish, and German (but not Russian)? Should socialists support national independence on principle, to weaken the Russian Empire, or not at all? Should they resist national fragmentation so that capitalist industrialization could take root in a continental economic zone and generate a large revolutionary proletariat? These were all questions that French and German socialists tended to find tiresome, because they were irrelevant to electoral competition in national political systems; but they were crucial to any revolutionary from the Russian Empire. Luxemburg cut her teeth on the national question in the Russian Empire. She was born in 1871 in Zamość, a beautiful Renaissance town inhabited by Jews and Poles, ruled from Petersburg, with Ukrainians in the hinterland. Forced to abandon her studies in Warsaw after her associations with a socialist group were discovered, she emigrated to Zurich in 1889 and began a doctoral dissertation about Poland’s economic development. In her view, since the partitions of Poland in the late eighteenth century by Petersburg, Berlin, and Vienna, the part of the country attached to the Russian Empire had become organically connected to Russian markets. Thus its separation, she implied, would be inherently reactionary from a Marxist perspective, slowing economic growth and thus the development of the working class. Yet the letters reveal that the argument about Polish independence was as much or more political, or even personal, than it was economic and ideological. In Zurich, Luxemburg met Jogiches, who agreed with her that national self determination was a reactionary distraction from the revolutionary cause. Their opponents were a rival group of Polish student socialists in Paris, who represented the Polish Socialist Party. They took the opposite view: that Polish national independence was progressive, since it would create the precondition for a functioning democratic republic and thus for socialism. Their intellectual leader, Kazimierz Kelles-Krauz, also had a Marxist argument, which led to a very different conclusion than Luxemburg’s. Industrialization, Kelles-Krauz maintained, created not only social classes but also nations. As people who spoke the same language were uprooted from the countryside and found themselves in the strange and alienating factory town, they would cling to each other and to their language, and come to see themselves as belonging to a national group. Regardless of whether or not a given nation had a recognized tradition of statehood, the forces of modernization would inevitably bring about national consciousness, and with it the tendencies to consolidate a national narrative around social history and to form a literary language from a spoken one. Thus in Eastern Europe rising Polish national awareness would inevitably be accompanied by Ukrainian, Jewish, and other national movements. Zionism was the crucial case for Kelles-Krauz, since his argument was that national politics depended neither on the possession of territory nor the tradition of statehood, but rather on modernity and folk language. He predicted a Jewish nationalism based around Yiddish. The stakes in this dispute, though carried out between graduate students with unfinished dissertations, were high. Polish socialists such as Luxemburg and Kelles-Krauz were condemned to seek the political (and financial) support of the French and German parties. French socialists in the middle of the 1890s were confused by the issue of Polish independence, and this Polish dispute, largely conducted in French by both Luxemburg and Kelles-Krauz, was really about them. French socialists liked to think of themselves as full of solidarity for oppressed nations such as Poland—but the French Republic was a military ally of the Russian Empire. Like the entire French political class, socialists were terrified of the German armies that had defeated France in 1870. The alliance with autocratic Russia, though perhaps ideologically distasteful, seemed to guarantee the security of France—and thus, French socialists reasoned, the sustenance of the Republic, the future of socialism, human liberation generally, and so on. French socialists, though they did not want to admit as much, preferred very strongly to forget about the Polish question in the interest of national security. To support Polish independence was to support the disintegration of the Russian Empire, and thus the destruction of France’s ally against Germany. Luxemburg, brilliantly, married the geopolitical anxiety of French comrades to a theoretical argument they could embrace: that creating new states would slow the revolution. Although Kelles-Krauz had the more interesting theory of modernization (it anticipated that of Ernest Gellner), Luxemburg won the political argument. At the congress of the Second International, held in Paris in 1896, she prevented the passage of a resolution unambiguously supporting Polish independence. Luxemburg was writing under a pseudonym, Maciej Rózga or “Matthew Rod,” that suggested a good beating, and she was writing with a polemical fury that can be understood only with the help of these private letters. She and Jogiches were young, and it was them against the world and its evils, represented by erroneous fellow Poles in Paris. To be sure, she had theoretical and political reasons to oppose the independence of the country where she was born, and these were not lightly to be discounted. But what the letters convey (I also checked the other side of the correspondence) is that Luxemburg and Jogiches very much wanted the fight, and very much wanted to be right. In their polemical struggle against Polish independence, Luxemburg developed and displayed for the first time what might be regarded as a polemical monism: only one thing in the world really mattered, the international revolution, and those who opposed her view were not only wrong but were hindering the advance of history. Her relationship with Jogiches also crystallized in a certain awkward but productive form. She was the energetic writer and he was the distant critic to whom she would pretend to look up for as long as she could. Her time in Paris, while he remained in Zurich, set an enduring pattern: for most of the remaining decade or so of their time as a couple, they contrived to be in different cities. The emotional high points of their friendship can be found in the letters, since they generally had no other means of communication. This gives the letters an oddly dual quality, since they lurched back and forth between embarrassing expressions of tenderness and squabbling over editorial decisions. It also, I think, supplied much of the frustrated anger that the two of them directed against their opponents and enemies. Luxemburg could not have become such an effective young agitator without Jogiches’s early guidance, but she also would not have developed further into an imposing activist and theorist if he had claimed her, as she wanted, as his wife. I suspect he understood that. In 1898, Luxemburg moved to Berlin (without Jogiches) in order to make her name with leading German socialists and earn a place in the German socialist movement. Germany, along with Austria-Hungary and the Russian Empire, was one of the three partitioning powers of Poland, and German comrades wanted her to work among Germany’s large Polish-speaking minority in Upper Silesia. Like Luxemburg, the German party leadership believed that Polish independence was a folly, but for different reasons. In her case, it was all revolution and rivalry. For German socialists, Marxism involved a certain cultural imperialism, since they imagined that historical progress would spread German civilization. Luxemburg’s most important interlocutor in Berlin believed that “one cannot do the Polish workers a greater favor than to Germanize them.” She herself did not hold this view, believing instead that the revolution would somehow in itself resolve all national questions, such that deliberate assimilation was just as misguided as work for independence; but she put her considerable talents at the beck and call of people who did think this way. She went to Silesia and delivered stirring speeches to the Polish coal miners, who seemed to like her. In Silesia, some of the motivation seems to have come from personal intra-Polish rivalries. The same people whom she had opposed in Paris, representing the Polish Socialist Party, were also active in Silesia among Polish workers there. Writing to Jogiches, she expressed her pleasure that she could once again scrap to her heart’s content with her fellow Poles. By this time, Luxemburg had herself endorsed the creation of a rival Polish socialist party, Social Democracy of the Kingdom of Poland, which opposed Polish independence. This rivalry was to produce some of the dominant figures of East European politics. The emerging leader of the Polish Socialist Party was Józef Piłsudski, who later would indeed lead his country to independence. One of Luxemburg’s comrades was Feliks Dzierżyński, who would later found the Soviet secret police. Luxemburg consulted with Jogiches about how best to bring down Bernstein and vault herself to the heights of theory of the Second International. But she also developed contacts of her own with the most prominent German theorists. In part, she simply awed them with her talent. She was immensely well read and learned to speak German very well. She could stir large crowds and befriend workers in bars while speaking a Marxist idiom. She also reached leading German Marxists with a certain kind of feminine wile. For Kautsky, as for a number of other leading German theorists, she became the woman in their lives with whom it was interesting and permissible to spend time alone. As a rule, German socialists in Berlin at the turn of the nineteenth and twentieth centuries led domestic lives that were irreproachably bourgeois, with what we might regard as very traditional marriages. Luxemburg, who was always careful to befriend the wives as well, offered the time and the energy associated with her unattached state, as well as the undeniable appeal of her superior mind. Thus when the crisis of Bernsteinian revisionism hit German social democracy, Kautsky was only too happy to support Luxemburg as she wrote her counterblast. As with the Polish national question and Kelles-Krauz, so with revisionism and Bernstein: it took a personal opponent to motivate Luxemburg to articulate a theory that supposedly defended the one and only correct Marxist doctrine. In response to Bernstein, Luxemburg wrote a short book and then a long one, both defending what her opponents, snidely but essentially correctly, called “the automatic collapse of capitalism.” Drawing from the practically unreadable second volume of Marx’s Das Kapital, she argued that the markets from which capitalism draws are inherently finite, and that therefore the system must eventually find its limits. In some way which was always a bit unclear, the working class would come to understand its historical responsibility and seize power. In Berlin, as in Paris, Luxemburg had found the radical ideological formulation that happened to coincide with what the powerful men wanted to hear. Her position was victorious in politics, even though, as we can see from our perspective in time, it was Bernstein who was closer to the truth. It would be wrong, though, simply to regard Luxemburg as an unusually smart woman who cozied up to powerful men in order to make her own name and to experience the satisfaction of believing herself to be right about everything on the public stage. When she was young, she both adored Jogiches and rebelled against him. As time passed and her affair with Jogiches finally ended, she found younger men to adore (one of them the son of a friend) and older men against whom to rebel. Not long after supplying Kautsky with the ideological weapons to defeat Bernstein, she turned against Kautsky as well, even while remaining close to his wife. In the summer of 1914, when most of her German socialist friends succumbed to the prevailing nationalist spirit and supported the war, she remained calm and steadfast in her opposition. We will never know what would have happened had the German social democrats summoned German workers to a general strike in the summer of 1914 rather than summoning them to fight the French, but it could hardly have been worse than what did in fact happen to them and to everyone else: ten million dead soldiers, the shattering of the first globalization, the end of the old political order without adequate preparation for the new, the embitterment of many Germans, the Bolshevik Revolution. Luxemburg had never thought much of Lenin, since his revolution was one of conjuncture and calculation, where hers was one of faith in history and its chosen class. 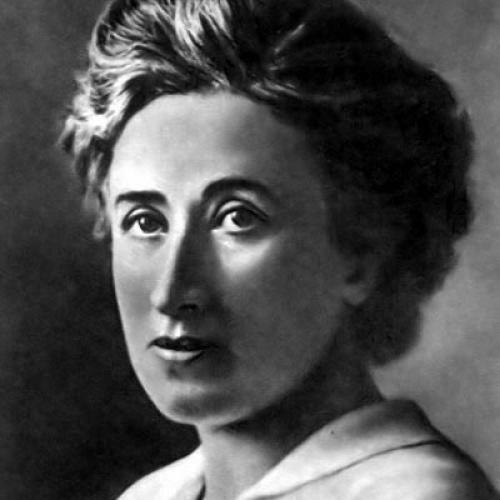 Without a revolution in Europe, she thought, “lasting success” in Russia was “not to be counted upon.” She feared that socialism brought to backward Russia through violent revolution would discredit the socialist idea. Her only hope was that the Russian experience could inspire German workers to take power in their own much more industrial country, so that a socialist Germany could then help Russian comrades. She did what she could for that German revolution, and was killed. This collection of letters is meant to recall the theoretician Luxemburg as a martyr of a revolution long past, and to confirm the sentimentalized Rosa as a kind of decoration of the German far left. Yet in a far more direct way than her idolizers might dare to think, the record of her career is pertinent to the problems of the present. We are, today in America, in a Luxemburgian economy. Inequality between the rich and the poor in American society has grown well beyond what, not so long ago, would have seemed politically tenable. American workers find themselves facing dim prospects in areas where German workers during the Second International could rightly anticipate improvement, such as unionization and health insurance. The dominant American intellectual reaction to this situation these last thirty years has been a kind of Luxemburgism à rebours: capitalism will not automatically destroy itself; it will automatically correct itself. We have rejected one faith-based autonomism only to accept another. It is a little unclear just why we embrace the mysticism of auto-correction, which is just as contrary to the evidence as the mysticism of auto-destruction. Our parsimonious neoliberalism much resembles Luxemburg’s Marxism, with its certainties about the primacy of economics to all other spheres of life, its polemical monism in arguments with its opponents, and its tendency to use economistic metaphors rather than words. Replace Luxemburg’s romanticism about a growing working class with ours about the bloated American financial sector, and the two visions square rather nicely. As Luxemburg failed to see, and we do too, the particular shape of the major institutions of the modern world is not defined by the larger forces that make them ubiquitous. Luxemburg was sure that the natural development of capitalism would automatically resolve all national questions, and clearly she was wrong. Yet simply taking the opposite view hardly resolves the matter. Many of us seem to be sure that unregulated and unhindered markets will strengthen the American nation. If that were true, then the richest among us would be the most eager to pay their taxes and send their children to war, neither of which, as a general rule, seems to be the case. The market and the nation are here to stay, but only if we treat them as objects of reason rather than objects of faith. The nation is not doomed to class struggle because it is not doomed to growing inequality—but inequality is not a problem that solves itself. The nation and the market are what we make of them. The lesson of Luxemburg’s career is not just that she was wrong and we are right. It is also that we must take responsibility for nations and markets, rather than riding waves of determinism, bullying opponents with reductive arguments, and hoping that history will come to the rescue. It didn’t, and it won’t. Timothy Snyder is a professor of history at Yale University and the author, most recently, of Bloodlands: Europe Between Hitler and Stalin (Basic Books).